We have been relaxing for the last 2 days in the ‘Yak and Yeti’ hotel in Kathmandu, which has been very nice. This morning the last members and guides of Stephen’s Expedition Team arrived here as well. Our bags… well… they are on their way from EBC to Lukla and then they still have to get to Kathmandu… so we are not going to wait for them; they will get shipped later. Getting out of EBC was epic. As reported, the AAI Team got back to EBC around lunchtime on the 25th. By then it had been snowing solidly for over 12 hours – and it wasn’t going to stop; on the contrary. It continued to snow that day and night. In fact it snowed so much that during the night, unknown to all of us sleeping, our tents slowly but surely completely got covered in snow. Luckily some of the guides were on the ball, got up in the middle of the night, woke everyone and made sure all the tents got uncovered partially, to make sure no one suffocated. Closer to the morning we woke up to find the sherpas literally digging our tents out from under the snow. This was officially called a ‘freak snow storm’. We all got up and convened in the dining tent. By then some of the sleeping tents and the cook tent had collapsed; there was 5ft/1.5m of snow by then and it was still snowing. It was decided that we would march out of there all together in a tight group. Some of our sherpas broke the trail for us (they did an amazing job) and off we went, single file, tight formation, with our guides looking after us, hip deep in snow with more snow falling. The first 2 hours were nerve racking; once we got out of the danger zone (avalanche danger and steep drop-offs either side) it got a ‘tad’ easier. 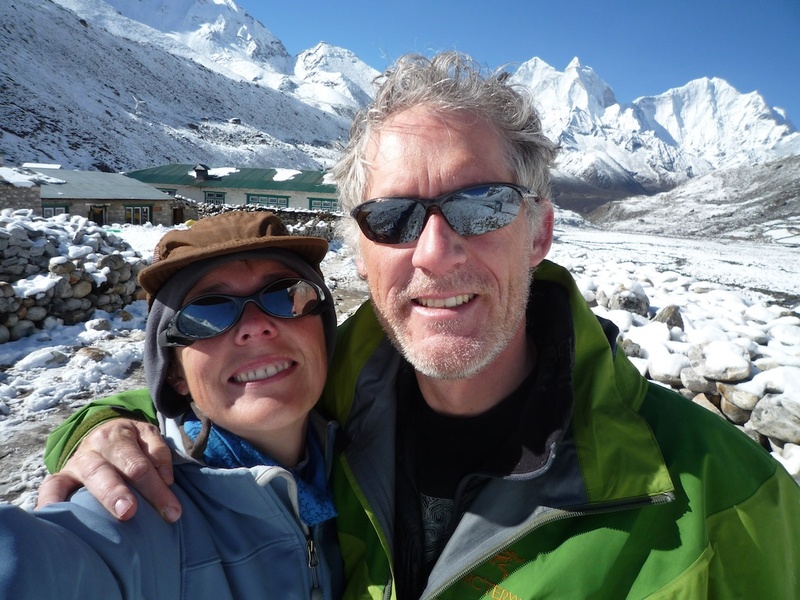 We briefly stopped in Gorak Shep and Lobuche and made it to Pheriche that day. We left at 9am and got there around 6pm.It was the hardest day of hiking I have ever done in my life and I don’t ever want to have to do that again. Thanks to Stephen and guides Garrett, Mike (the first 2 hours) and Vern (the last part) I got out of there safely and without panicking. Also thanks to the whole team banding together. It was gruelling but we made it. The next day miraculously (to us at least) the weather in Pheriche was clear in the morning and 8 of us who had booked helicopter rides out of there actually did get out on helis. We were overjoyed once we landed in Kathmandu and were whisked away to our hotel! On arrival in the hotel Stephen and I were greeted by Alison, Stephen’s mum, who’d been waiting for us in Kathmandu. Very nice to have her here with us! As said we are now all relaxed (and cleaned up) and are looking forward to starting the trip home tomorrow. It has been great to be able to relax and sit down with members of the team in the last few days. As for our bags.. well we were only allowed to take survival gear out of EBC, so the rest will get to us when it does. We have capable people sorting that out.greetings from Kathmandu,next post should be from home in SF!! What an end to the adventure! Enjoy Kathmandu and have a safe trip home.